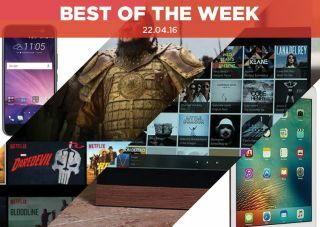 Best of the Week: Apple iPad Pro, HTC 10, Nativ Vita multi-room, Netflix 4K HDR and more | What Hi-Fi? This week Wharfedale confirmed its new Reva range of hi-fi speakers, Netflix committed itself to having over 150 hours of 4K HDR content in its library by the year's end and Nativ 's Vita multi-room system combines video and high-res music streaming into one package. On the reviews front we had HTC's 10 smartphone, Humax's HDR-2000T Freeview box and Apple's 9.7in iPad Pro tablet. We first caught a glimpse of Wharfedale's Reva series at the Bristol Sound & Vision Show in February, and the British hi-fi manufacturer has now confirmed its upcoming release. Building on the company's affordable Diamond range, the Reva family is said to deliver better performance for an increase in price. The cheapest speaker (Revo 1 Bookshelf) comes in at £450. The drivers, cabinet construction and port design have all undergone upgrades from the Diamonds. The series is scheduled to go on sale this May. Netflix has championed 4K and has been releasing content in the format for some time. It's now committed to releasing more than 150 hours of 4K HDR content by the end of 2016. To benefit from Netflix 4K HDR you'll need a HDR or Dolby Vision compatible TV that also supports the Netflix 4K app (that currently means 2016 Panasonic and Sony sets). Once that's sorted you'll be able to enjoy the likes of Marvel's Daredevil & Jessica Jones, Bloodline and A Series of Unfortunate Events in the Ultra High Definition format, with more yet to come. Like a rug that ties your room together, Nativ wants to bring all your wireless needs into one space. Its Vita multi-room system aims to seamlessly incorporate audio and video streaming services and locally stored music, and distribute them around the home to connected wireless speakers and headphones. It's able to do this through the Vita, a touch screen controlled hub that also supports high-res music playback and video streaming services. You can pre-order the Nativ Vita from its Indiegogo page for $999. "It might have lost its focus last year, but with the HTC 10 the company is back to its best"
With Samsung and LG launching excellent new phones, the pressure was on HTC to get its latest handheld right – and it has. The M9 left users wanting when it came to battery life, camera and aspects of picture and sound. The 10 ably steps its game up, improving in all areas save for an issue with the quality of low-light photos. This is a return to form for HTC and it couldn't have come at a better time. "Humax knows its role and gets on with it"
Humax is nothing if not consistent. We've come to expect quality and with the HDR-2000T set-top box, the company has done it yet again. It's another intuitive, easy-to-use Freeview HD box, complemented by smart apps, catch-up channels and well thought out features, including the ability to watch a programme from the start while you're recording it. Picture and sound is, as usual, excellent with the only minor issue being the insubstantial remote control. Otherwise it's another lovely piece of kit from the folks at Humax. "Not only has Apple succeeded but, in some ways, it has even managed to outshine its big brother"
Apple is the dominant force in the premium tablet market, and the 9.7in iPad Pro is another reminder of why. It carries many of the traits seen in its bigger brother, with terrific picture quality and impressive sound from its internal speakers. If you thought the 12.9in was too big, this may suit you better. Surprisingly the sound via headphones is a touch underwhelming, lacking a little sparkle. Regardless, the Pro is a belting effort from Apple.